Summer is heating up and as temperatures rise, do yourself a favor and schedule a cool getaway. How about riding in the open gondola car of the Cumbres & Toltec Scenic Railroad as it rumbles its way across the Rocky Mountains at a stately speed of 12 miles an hour through a nice soft breeze and refreshing mountain air. Dating back to 1880, this National Historic Landmark that moves is an authentic look at the early days of railroading. It’s also very cool. Trains leave daily from both Chama, NM and Antonito, CO. You can ride in traditional cars, in an open gondola car, on the platforms between cars, or in a stately parlor car, like the ones once used by railroad executives. There are onboard restrooms and a bar car. Full day, 64-mile long rides stop for a hot lunch at scenic Osier Station at the midway point. But the best thing about the train is that it is off the grid, crossing the borders of Colorado and New Mexico 11 times as it climbs and circles through the Rockies. The tracks go where no roads go. One minute, you are surrounded by meadows of quaking aspens and wildflowers. Deer, elk and even bears have been seen from the train. The next minute, you’re riding on a narrow ledge through Toltec Gorge, with views straight down 600-feet to the roaring river below. There are bridges, trestles and tunnels, and always, there is the fragrance of the railroad – the sweet smell of pine trees and coal smoke. The only thing that is better than hearing the steam whistle echo off the mountains, is the natural air conditioning to be found along the route. Temperatures drop 3.5 degrees for every thousand feet of altitude you gain, so as the train steams higher and higher to eventually top out on Cumbres Pass at 10,015-feet, the temperature drops as you go along. Bring a jacket – even in the height of summer, and especially on evening dinner rides, where the only light is from the moon and stars above and the searching headlamp of the locomotive as it speeds through the forest and across the high plains. 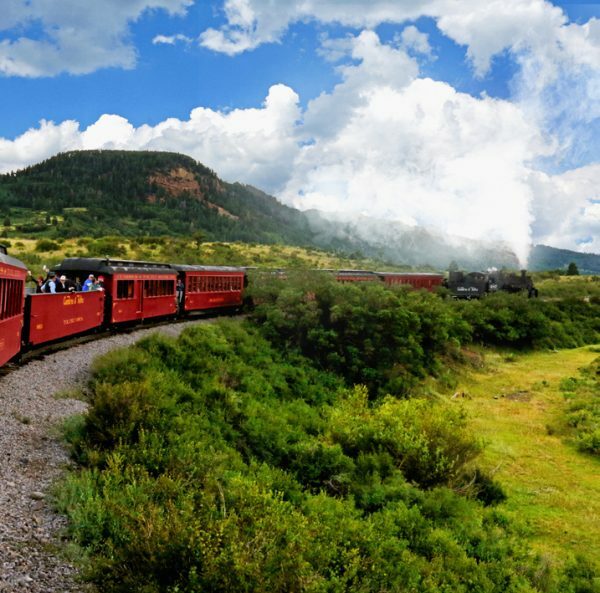 So plan to cool off this summer on the Cumbres & Toltec Scenic Railroad! WHERE: Trains leave daily from Antonito, CO and Chama, NM. Antonito is 30 minutes south of Alamosa, CO (gateway to Great Sand Dunes National Park) and one hour north of Taos, NM. Chama is 45 minutes from the resort town of Pagosa Springs, CO. Both Antonito and Chama also have a selection of motels and B&Bs. WHEN: Trains started running on May 26 and run daily until October 21, 2018. Fall is an especially pretty time since the tracks pass through mile after mile of brilliant gold aspens. Full day trains depart from each station at 10 a.m. There are nine different ticket packages, as well as many special trains such as a Wildflower Express, Dinner Trains, Concert Trains, and even a Fourth of July Fireworks Train. Visit www.cumbrestoltec.com for all ticket details. 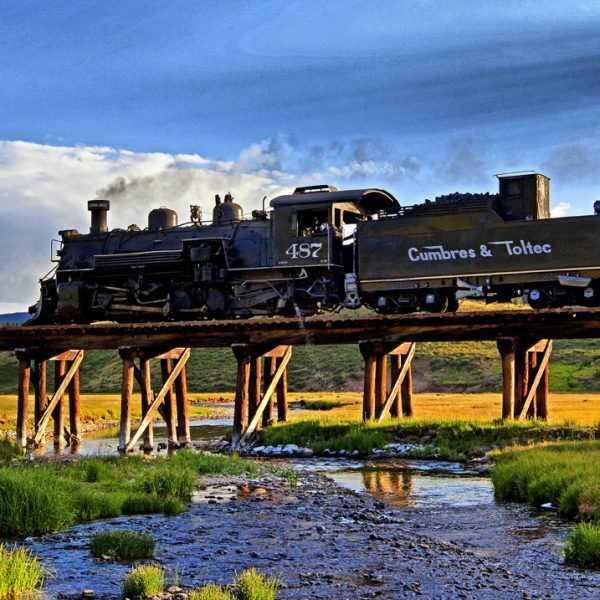 WHAT: The Cumbres & Toltec is the highest, longest and most authentic steam railroad in North America covering 64 miles of track. It is owned jointly by the people of the states of Colorado and New Mexico, and it crosses the borders of these two states 11 times. It was picked by the readers of USA Today as the No. 1 train ride in the U.S.
WHO: Every famous figure in the Old West rode the train, including Doc Holliday and Wyatt Earp. It has been featured in more than two dozen movies, including Indiana Jones, Wyatt Earp, the current film Hostiles, Butch Cassidy & the Sundance Kid – the Early Years, and many others. WHY: This off-the-grid adventure is a chance to experience the authentic Old West and see railroading exactly the way it was in the 1880s. From the moment the engineer gives two long whistle blasts (the signal that the train is moving forward), you are back in time, feeling the rattle of the cars, smelling the coal smoke, hearing the steam whistle, and seeing the exact same mountain, gorge and river views that Westerners saw almost 140 years ago. NOTE: The Cumbres & Toltec Scenic Railroad is more than 100 miles away from the wildfires that firefighters are battling in Northern New Mexico and Southeastern Colorado with business as usual and no adverse conditions as a result. The railroad has is vigorously and proactively addressing fire concerns to provide a safe and enjoyable ride for all.